I dabbled a little in music many years ago. Click below to hear some early recordings. And please be kind... these were recorded a long time ago on a very low budget. Even so, they are very much acceptable. All my music is copyrighted and registered with the appropriate organisations. Hence, distributing or re-recording is not allowed by law. However, it is provided here for listening, free of charge. Please note, the mp3 version available here is of better quality than the music in the Youtube® version. However, for the full effect of this beautiful, moving presentation, you will need to view the video as well. Canefires - when I grew up in the 60's most sugarcane was burned before being hand-cut by cane-cutters - a particularly tough breed of workers by sheer necessity. Back then (not always now), most breeds shot up long, pretty pale lilac flowers called 'tops' once mature. These swayed with the breezes, and were a sign that the cane was ready for burning and cutting. Burning of the canefield removed most of the 'trash' - the leafy part of the tall, thick grassy plants, making a cutter's tough task just a little easier, even if very dirty. Fires also forced out most dangerous snakes and other pests from within the thick foliage. Fires were generally carried out in the evening, so that the wind had dropped, thus reducing the risk of a fire spreading to other fields. Most often it also meant that the workers who cut the cane (cutters) could also be present to help with the burn, and to make sure it didn't 'get away' into other fields. 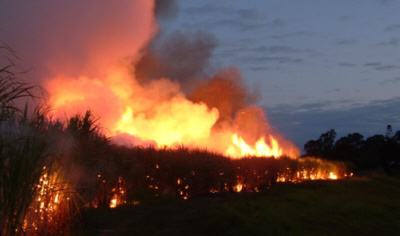 Modern harvesters don't generally require sugarcane to be burned, though many farmers still do it. Modern machines have huge fans that blow away the trash, so there is no need to burn if off. The advance of suburbia on farming ground also plays a role in discouraging farmers to burn their fields, since townfolk don't generally appreciate the sooty residue on their cars and houses. Canefires create their own updraft, sending glowing embers high into the air (called 'fliers'), which can pose a risk to setting other fields alight. These embers (commonly called 'fliers') then die out once airborne, and are then often carried many kilometres away. This huge cloud of burned sugarcane leaves then falls back to earth as a myriad of thin, black and sooty, small curly ribons, where it dirties just about everything. Hence, it is called 'black snow' and is most certainly the 'housewife's curse'. Sugarcane is harvested by modern machines nowadays, doing the full day's work of many can cutters in just minutes. In my childhood, burned and felled (cut) cane was lifted on to small railway wagons by hand. Filthy, blackening and hard (and itchy) work! You may notice that I've included a photo of my dad using histractor-loader to pick up cut cane - innovation that was quickly obsolete once billet harvesters arrived. A billet is a small length of sugarcane, often 200-300mm (8-12 inches) in length, which modern machines create as part of the harvesting process. In the late sixties, there were even 'whole-stick' harvesters, which cut and 'topped' (removing the grassy top of the sugarcane stalk) in a single process. Again, these were a short-lived innovation that was quickly made obsolete once billet harvesters arrived. Then and now, sugarcane is/was planted in rows called 'drills' (I've even heard them referred to as 'rills'). Unburned billets are planted at short, regular distances, horizintally and in line with the rows. However, sugarcane doesn't need to be replanted every year. Crops have been known to 'ratoon' (to my knowledge) up to six times (six seasons, meaning six years)! In my dad's hand in one of the photos is a 'cane knife' used for cutting the sugarcane. It is a wooden handle with a long, wide, flat blade set into the end. Professional cutters would often use a blow-torch to heat and bend the blade somewhere about half way along its length, so that they could cut the cane off level with the ground, rather than leaving a sharp, angled stub, which could be hazardous to tractor tyres (tires). The small wagons (which carried a mere three tons maximum) were then transported to a railway siding, where a small locomotive would hook up to haul them away to the sugar mill. When I was a boy, (I still clearly remember) these locomotives were steam-driven, replaced by diesel engine-driven locos as time went by. Indeed, when I was an apprentice at a sugar mill (Qunaba, near Bundaberg in Queensland, Australia), the steam locos there had only been removed from service the year before, and were all still parked at the mill. Interestingly, some of these same steam locos are now used in a local park there to take passengers on short rides. One never forgets the beautiful smell and sounds of a steam loco. As a child, canefires were common events, and always entirely captivating and exciting, and I hope you can catch a glimpse of that amazing life in my music and short video presentation by clicking the link below. Click here to hear or download Canefields.mp3 © Listen to it free. I grew up on a sugar-cane farm in a laid back, perhaps a-little-slower area of mid-north Queensland in the 1960s. My dad was a cane farmer, back when crops were hand-cut and often hand-loaded on to small wagons that were hauled to the sugar mill via a small steam locomotive. Sadly, I don't have a lot of photos of that era of can farming, but some of them, including a couple of photos of my dad, appear in the short film I made. My wife and I recorded the music, though on a very small budget, so it's a bit plain. We tried to get various radio stations to play it, as well as our local TV station. No luck. Please watch and share with your friends if you enjoy it. To watch my audio-video presentation of my song,	Canefields © on YouTube®, click here. Perhaps the real secret is this: whether we win each battle doesn't matter. Just the fact that we've learned is a victory in itself. Hatred too hinders us so often, and cripples us and our relationships. Indeed, hatred and bitterness will make us physically ill over time, and sap all our happiness. Freedom's Chains speaks for itself, I think. Like most of my music, it may be a bit basic, but I still find it soothing in a simple, honest way. I'll release this one very soon. Thank you for your patience.